Home • More Magic • Six months to go and my elves are already preparing for Christmas! Can you believe it – as of this week, it’s less than six months to Christmas! Like my sleigh, time definitely flies! Up here in Lapland, this means that’s it’s time for the real work to begin. In the first half of the year we get to relax a little, but now it’s all hands to the pump to make sure we’re organised for December. With so many children all over the world, this means an awful lot of planning and lots and lots of present making. Luckily, I don’t have to do it all myself! For many years now, I’ve had a fantastic team of elves up here in Lapland, all overseen on a day-to-day basis by Mrs Claus. Here in Saariselkä, the Saari elves love to be outside in the forest, where they learn how to care for the reindeer and the huskies, how to ice fish and all about the spectacular Northern Lights. They also learn how to drive my sleigh but, most importantly, they are taught how to be kind. Only once they have learnt all about “Family Kindness” do they become my official helpers. Christmas is a loving, giving, family time and we make sure the atmosphere is like that all year round in Lapland. The Saari elves are just one tribe of elves up here in Lapland – you can find out about all the other clever helpers who make the exciting toys I deliver every year, from games consoles to teddy bears, on the Santa’s Lapland elves page. Of course, the elves also really look forward to meeting all of you if you come for your holidays in Lapland around Christmastime. They love showing off the reindeer, the huskies and all the activities that they get up to. 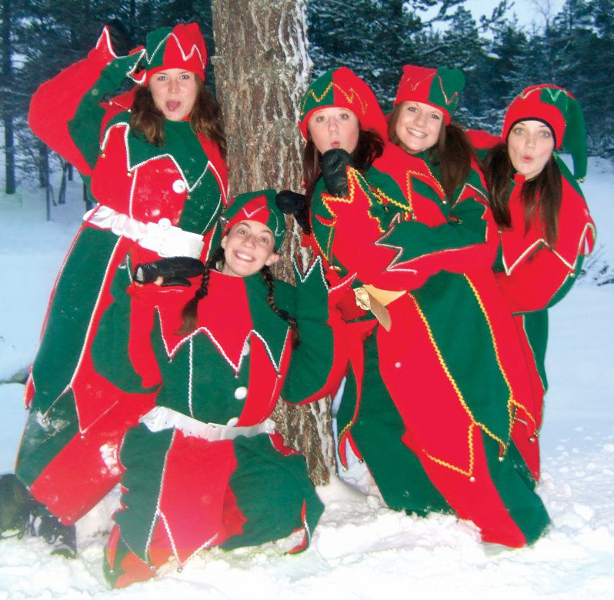 What’s more, it gives them great delight to involve all the families that come to visit in these fun activities to make sure everyone has a fantastic and memorable time in Lapland. When we have guests, it’s a great excuse for them to relax and have fun. You’ll be able to spot them easily enough – they wear red and green suits and hats with bells on so you’ll always know when an elf is nearby – unless they’re playing one of their silly games where they try to sneak up on people! Have you ever met one of my elves before? What would be your favourite thing to do if you were an elf? Why not let me know by commenting on my Facebook page? I always love to know what people think of my little helpers.